Queen duvet cover (88" x 88") featuring the image "Golden Gate Bridge" by Thomas Marchessault. Our soft microfiber duvet covers are hand sewn and include a hidden zipper for easy washing and assembly. Your selected image is printed on the top surface with a soft white surface underneath. All duvet covers are machine washable with cold water and a mild detergent. Cousin, How did you get up there? Can the general public get there too? Hi there. 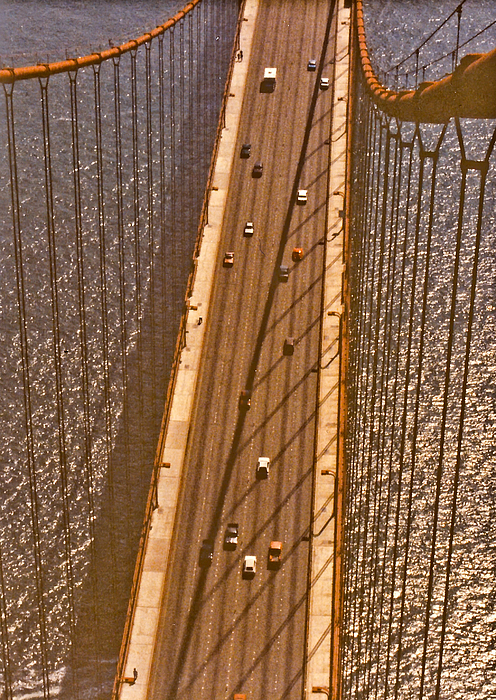 Back in the 80s, I was with the US DOT and working with the director of the bridge and he invited my wife and I on a tour of the bridge. With a guide, we took this tiny elevator up the Marin Tower and I took the shot from there. Awesome. It's not open to the public. Not even sure they would let me up there now.